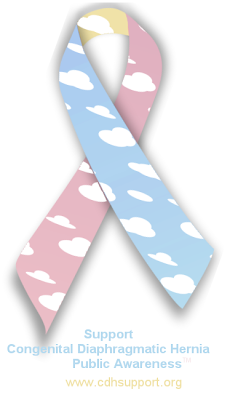 CHERUBS – The Association of Congenital Diaphragmatic Hernia Research, Awareness and Support. Here at CHERUBS, we wear many, many hats. Our first priority are CDH families and they deserve accurate information so that they can make the best decisions for their cherubs. We first published our Parent Reference Guide in 1996, giving parents a list of commonly used medical terminology and what it all means in layman’s terms. Advice from other parents on pumping breast milk or planning a funeral. Songs to play for a baby in the NICU. Information from recent CDH studies. Diagrams of CDH. Correct CDH statistics. An article about CDH written specificially for CHERUBS by a well-respected pediatric surgeon, our Vice-President Lesli Taylor, MD. We make sure that they know infection and pneumonia cost more cherubs’ lives than poor lung function. All of these things for them. Not to sensationalize CDH or gain attention for CHERUBS. But correct information for CDH families. We give information and support to families. Offering support services since 1995. We created the world’s first CDH web site, chat room, listserv, forums, blogs, newsletter and conference. Families are no longer alone dealing with CDH since 1995. We are proud of the fact that because our group has been so successful, several other CDH groups have spawned from our membership and follow in CHERUBS footsteps. There can never be too much support for CDH families! Not only do we support CDH families, but we also support other CDH organizations. We have worked with En Stitching Hernia Diafragmatica, Holland’s CDH group, for 10 years. Onno has attended one of our conferences and we enjoyed spending several days with him, hanging out and exploring Disney World after conference hours. CHERUBS Australia and CHERUBS UK now have non-profit status in their respective countries – with our blessing and the sharing of our knowledge. We work with the French and Italian CDH groups. We are strong supporters of Kays Kids, Rainbow of Hope, the Olivia Raine Foundation, Jack Ryan Gillham Foundation and Little Lambs. We worked with many of these organizations to collectively look out for CDH families best interests and fight the Congenital Diaphragmatic Hernia Awareness Trademark so that all CDH families can continue to raise awareness without fear. CHERUBS is very, very proud to be a member of the Alliance of Congenital Diaphragmatic Hernia Organizations which not only includes many CDH support groups but top CDH hospitals and researchers as well – all of us working together to help CDH families. Our second priority has always been advocacy and awareness and this is reflected in our interviews in over 100 newspaper articles, interviews for television shows such as 20/20, interviews for magazines such as Family Circle and Women’s Day. It is in the events that we have held for the past 15 years, teaching the public about CDH. Rallies and bake sales. Bowl-a-thons and ATV events. Formal balls and golf tournaments. Balloon releases and candle lighting ceremonies. In the 1000’s of web sites that link to CHERUBS and CDH info. In the 1000’s of awareness items we have been offering on our web site since 1997. We advocate for awareness every single day. We take our research very seriously and do not submit haphazard statistics or information to parents without checking with medical advisors first. We do our research the hard way – in the research library, talking to researchers, spending weeks going over every number before we release it to the members and public. We do not talk abstractly of CDH research, we do not write articles about the work of others found on the internet, we do not donate $100 to a hospital and call ourselves a research organization. We do actual research. We actually contribute to the CDH research community and have done so since 1997. It has not been easy and we have lost many a sleepless night tabulating data or pouring over medical journals – but our goal has always been to help lead the way to find the cause, prevention and better treatment of CDH. Now, we are compiling the 2008 Congenital Diaphragmatic Hernia Research Survey Results with the data of over 2500 CDH families. The CDH Study Group now holds the world’s largest database of research information on the diagnosis and immediate medical care of CDH babies. CHERUBS holds the world’s largest database of research information on the family history, neonatal care and long-term outcome of CDH babies. We have always worked together and continue to do so with several projects in the works. Our CDH Research site is under construction and will be ready by Spring, 2009. It will compile CDH research data on the fly and will be available freely to all CDH researchers, families and organizations. And all this is not easy. CHERUBS was started by 2 CDH parents with no experience but we gained non-profit status within 8 months. We started before there was an internet and without help. We paid our dues and did the hard work and we are so proud of all we have accomplished! CHERUBS is a charity and is run as such. It puts our cause first – helping CDH parents. We do not look at our organization in the business sense. Charities give. Businesses sell. We do not feel a need for competition or making calculated business plans to make the most money or own the rights to anything. We are not selling anything. We are giving away CDH information freely, raising awareness and offering support. Our “business” plan is created by following our hearts and consciences, not our bank account. This makes it sometimes hard to provide all the services that we would like to give – but in the long run it is what has made us successful in helping 1000’s CDH families and what makes our membership a family. CHERUBS is still run solely by volunteers. Dawn, our President, volunteers over 40 hours every week to helping CDH families through CHERUBS – while also having a family and running a business and going back to college for medical courses. Our Advisors dedicate a minimum of 20 hours each every week as well, with several also donating over 40 hours of our time weekly. We have an extensive web site with 1000’s of pages, forums, services and 24 / 7 support to families. We have blogs to maintain, Facebook, Myspace, and many other sites we keep updated with CHERUBS and CDH news. Newsletters and research to work on, awareness events year-round, fundraisers, books and more committees than most support groups. We have get-togethers and conferences. We maintain a huge e-commerce shop offering 1000’s of CDH awareness items – all original and designed by hand by us. We also have our accounting, IRS paperwork, state paperwork and legal paperwork. All meticulously done and when we are short on funds and donations – often Dawn or one of the Advisors will personally pick up the tab to make sure that CHERUBS can continue to offer a needed service. There is dedication and heart in CHERUBS. Everything we do, we do to help families and the CDH community as a whole. We do this with honesty, integrity and honor, making our cherubs proud. We are 1 big CDH family and we offer positive and comforting support to each other. Our focus is, and always has been, helping CDH babies and families.